I can’t believe it’s been 6 months since I last posted. I’ve been busy taking yet more sewing at FIT – made some velour pants and a blazer/women’s suit jacket in Sewing II but, while they both came out well, nothing really to write home about. Now, I’m in the midst of the first course of their Haute Couture certificate: Haute Couture Sewing Techniques (will post about that soon). IOW, I’ve been sewing a lot of stuff NOT for me. 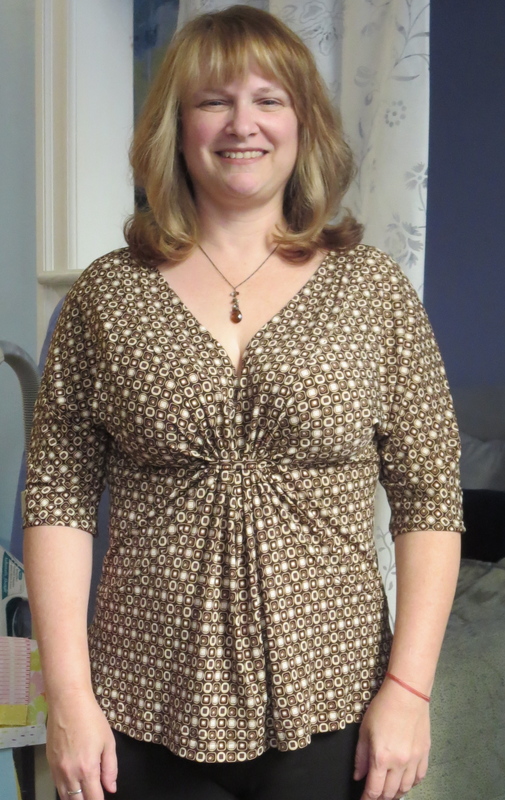 I decided to right that wrong by finishing a Butterick top I started 4 years ago when I didn’t really know much about sewing at all. I came across it looking for some materials for my current class. It was 80% done when I stopped work on it – presumably b/c I got distracted by a different, shinier project. I really need to stop doing that. In any event, it came out great.. with many caveats. It’s done. I’m very bad about finishing stuff so this is good all on its own. I really like the fabric still. 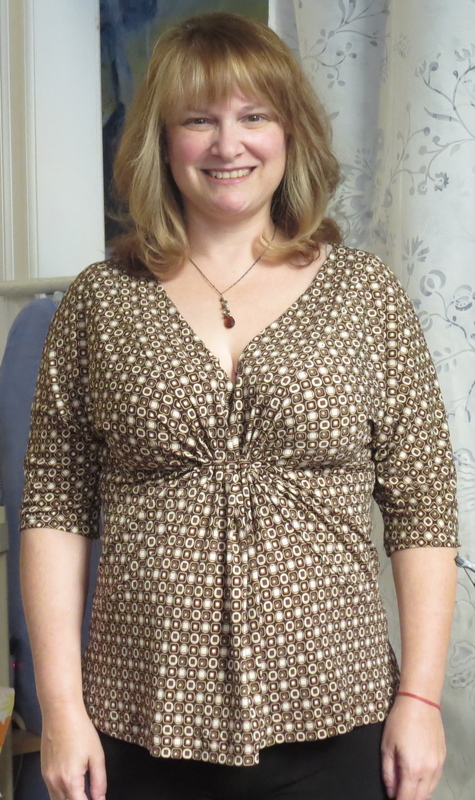 Despite having gained weight since I started it, it fits well enough – thankfully. It’s the same length – front and back. Having large breasts, often RTW shirts ride short in front. Since I made this myself, I set up the hem to be even all the way around using my lovely assistant, Duct Tape Alex, to get it right. It’s long enough. I am longer-torsoed. That plus my breasts, often tops are too short overall for me. I made this one to my own hip length. Even in lower rise pants, my belly will not show. Sweet. This is/was my first knit project and I really didn’t know what I was doing and if you look closely, you can tell. Oh well, got to start somewhere, right? I had no idea about pattern matching back in 2012. Had I started this now, it would have attempted to fussily match it to a couture level. 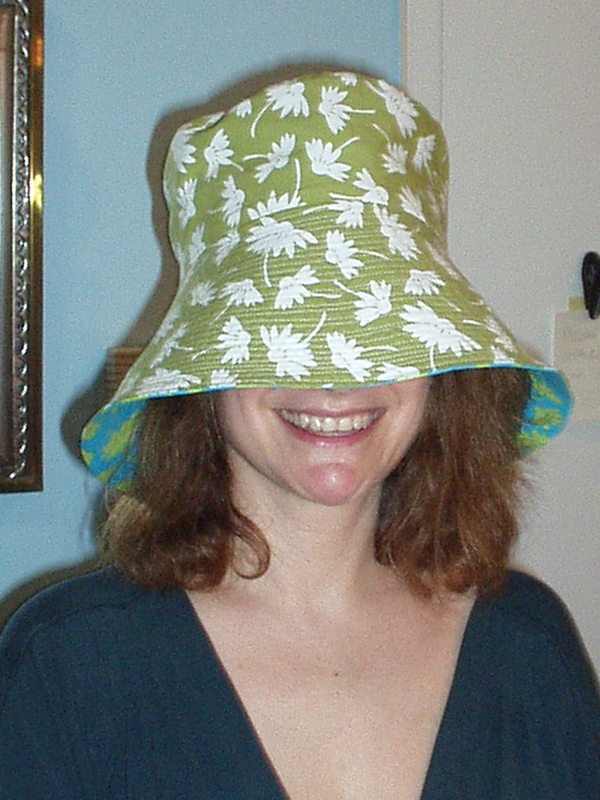 But I made the entire front before I stopped sewing it and there is some weird pattern matching on it (or lack thereof). Oh well. This weekend, I made the back so I was able to match the CB pieces so they form a straight line but that was the best I could do without recutting them. I can live with this but next time, they will match! There is some weird sewing going on on this thing and to be honest, some of it was done as recently as Saturday afternoon. You can’t see it so I left it but no points for me on sewing. Bad Alex! 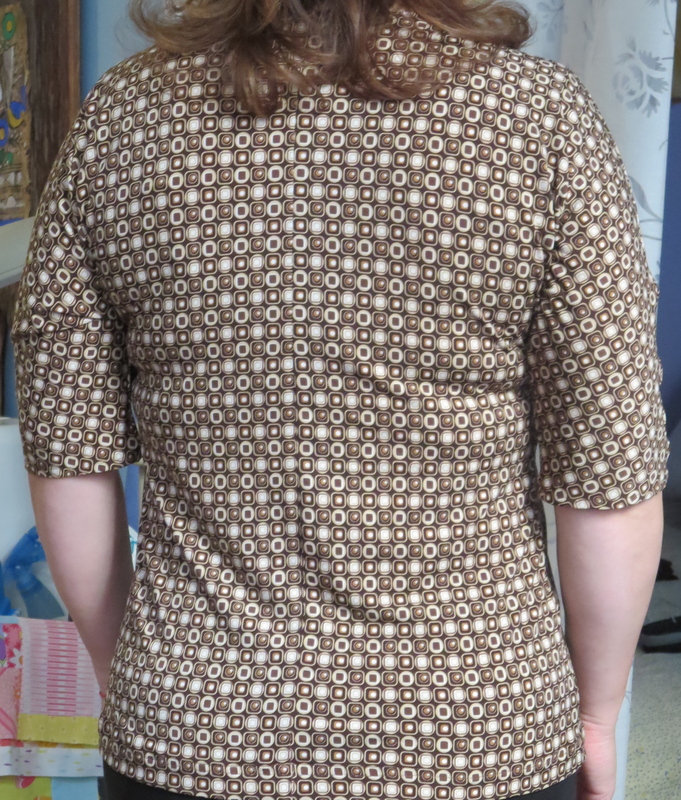 Back – can you see the CB join/pattern match? Sort of, but not bad. How to basically use my serger. Sort of learned how much to stretch while sewing on regular machine with a knit. Will have to continue to work on this. That certain ‘haute couture’ techniques, while fussy, are a total save. I thread traced the hem line which was helpful since it sometimes wasn’t level with the patterned fabric. I also basted the side seams before sewing which allowed me to take in some extra fabric around the armhole making it much less blousey, AND, adjust overall the seam allowance in that area to get a better fit. Third, I did some blind stitching and you really can’t see it – all those hours of practicing tiny stitching in Haute Couture class are paying off! My Brother NX450 does not love sewing knits. Could be me (probably) but I’m hopeful my next top will be more serger heavy as I still want to get to know it better. 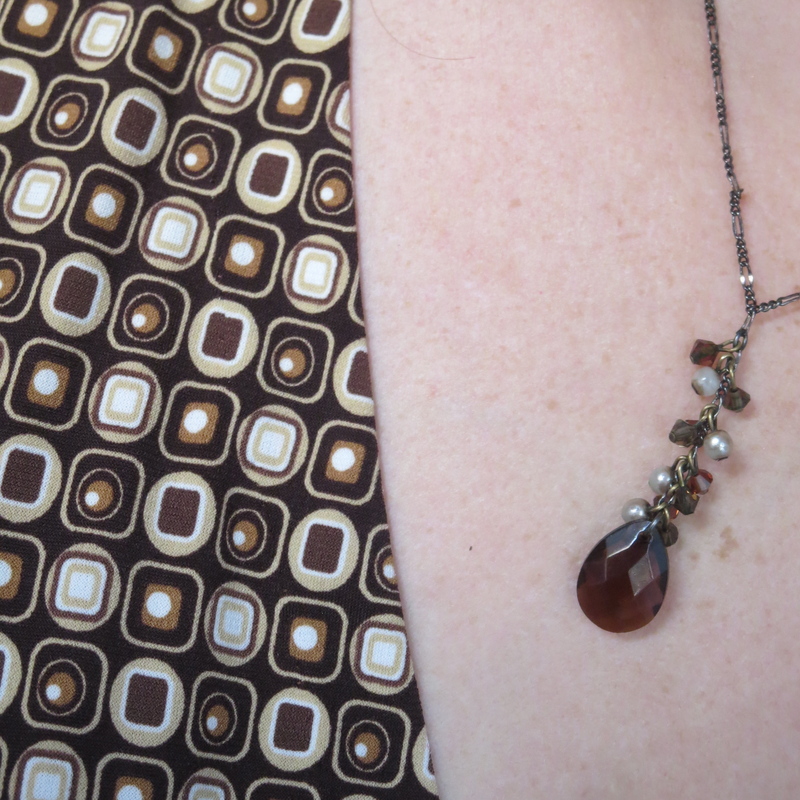 Blind stitching at neckline. Hard to find – go me. This entry was posted in clothing, sewing, Uncategorized and tagged B5495 on October 16, 2016 by Alexandra.